It Is Time To Replace Your Divots! 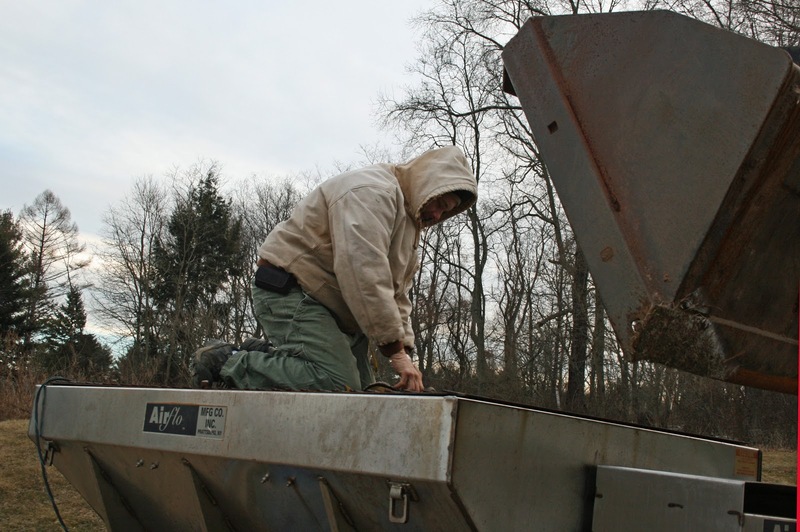 We are removing all the divot mix from the golf course because the colder temperatures keep seed from efficiently germinating. We ask that you now simply replace your divots. During the primary golf season we use an outstanding divot mix composed of sand and peat moss. While this mix requires a bit of a budget commitment, its benefits far out way the cost. The mix has excellent water holding capacity which allows our desired creeping bentgrass seed the best chance of germination. Creeping bentgrass is our seed of choice because it is genetically superior to the inferior, indigenous Poa Annua. There are times of the year when you may notice that the seed does not seem to germinate as well as others. This is primarily attributable to not enough moisture in the filled divot. We cannot irrigate our fairways with the sole purpose of germinating seed in the divots. If we did this, we would be reducing playability because the fairways would be over-watered. Fast and firm is always our goal. Other benefits of the mix are that the product is sterile and no weed seeds are introduced to our fairways and tees. It is also dry. 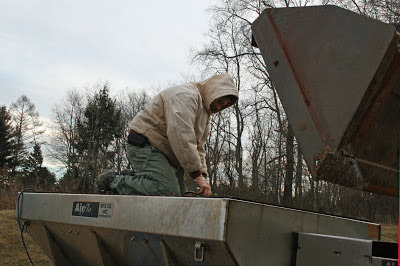 Dry mix is imperative because we do not want the seed to germinate in the divot boxes or bottles. This would be a waste of the high quality seed we use. Replacement of divots in the early spring and late fall is important because we must always utilize our resources in the most efficient manner possible. In essence, getting the "biggest bang for our buck"! Frost Delays Are Here. Be Prepared! I Am An Early-Morning Golfer. What Is The Justification For Frost Delays? Frost is essentially frozen dew. 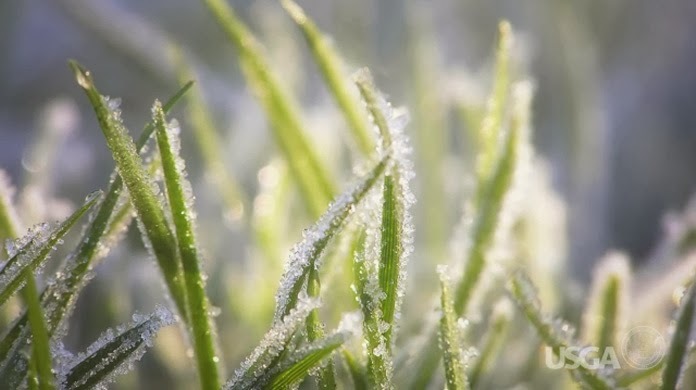 Ice crystals visible on the outside of the plant can also form on the inside of grass blades. The grass plant, normally resilient to footsteps or cart traffic, becomes brittle and fragile when ice crystals form. Under the pressure of traffic, ice crystals puncture living plant tissues and rupture plant cells. Damage will not appear right away, but it will show up in footsteps and tire tracks the following days as the plant is unable to repair itself and begins to die. Frost damage can occur on any turfgrass mowed at any height, but it is amplified when the plant is mowed low, as on a putting green. Keep in mind that a foursome typically takes several hundred footsteps on each green, so even allowing just a few groups to play when frost is present can be very damaging to the greens, as well as to the rest of the golf course. 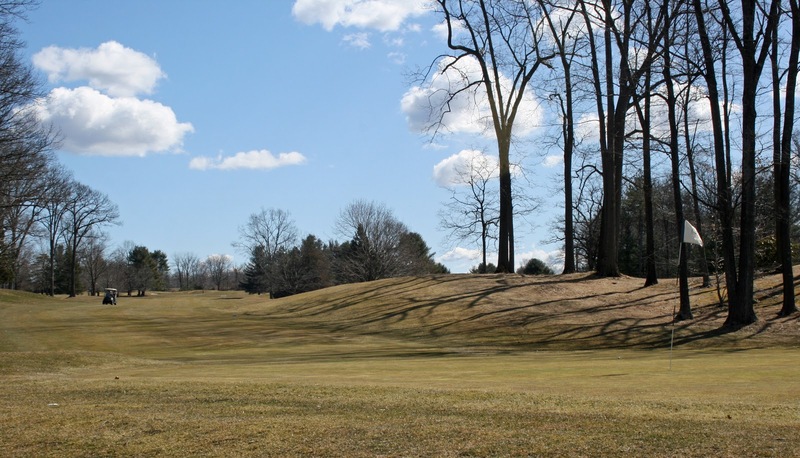 It is not completely understood when frost will cause damage, so the decision to keep traffic off the course must be made conservatively to protect the condition of the course. 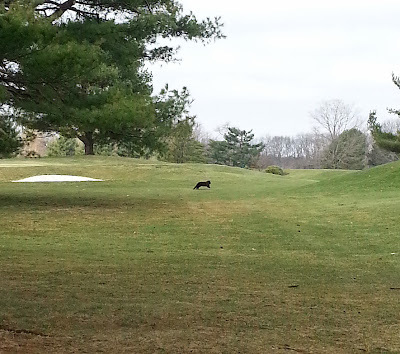 For this reason, golf facilities are wise to delay starting times in the morning until frost has completely melted. This is a subject I don't often write about. I would love to take all the credit, but Mother Nature truly assists me at this time of year! We are entering the period of time where we can reduce mowing, raise the height of cut and maintain excellent playing conditions on greens. Heat and humidity stresses are long gone. The turf begins to slow its leaf-growth and our applied nutrients are feeding root-growth (my ultimate goal in October / November and beyond). Our maintenance plan of optimizing root growth is actually easier at this time of year. I also must balance moisture levels, while raising the height of cut and making sure greens don't get too fast. If you are playing this weekend you should know I'm more concerned about the greens getting too firm and too fast! We only rolled this morning to get the dew off the greens. They were rolling at 11.5 feet after the roll and they will only get quicker as the surfaces dry out. I will be watering this afternoon to make sure they stay receptive to good approach shots. We actually won't mow them again, at the higher height of cut, until Wednesday. I am raising the height of cut to increase the amount of leaf surface of the individual turfgrass plants on the greens. This improves photosynthesis. Photosynthesis is the food making process that all plants use to survive. It is the ultimate health factor our green's turf needs to prepare itself for the stresses of winter and the summer of 2014. Our maintenance practices in autumn focuses on root growth because leaf growth naturally reduces and nutrient uptake is almost entirely used towards root enhancement . It is my job to optimize the plant's genetic capability to achieve it's root enhancement but not reduce playability. Yes, the proverbial tightrope. Thankfully, the tightrope is easier to walk in the middle of October! Here is what you really need to know... Stay below the hole because the greens are rolling great! They will be that way until we "put them to bed". Putting them to bed is when the soil freezes! Your guess is as good as mine! Let's hope Mother Nature is on our side! I will certainly keep you updated!!! Aerifying Greens Complete! We Started Months Ago... We Finally Finished! OK... We finished the process of aerifying, overseeding and topdressing greens on Thursday, but the planning started months ago. Year-long turf health balanced with consistently outstanding playability means everyone is going to have to give in periodically. You can't have one without the other. The proverbial tightrope. I won't bore you with the long-term info that most are not interested in. Let's keep them healthy, improve them and get them back to normal ASAP! I predict a strong finish! Let's talk in terms of the last two weeks. I cant wait to aerify, overseed and topdress the greens! Tough weather, compaction, overseed, etc. etc. Two weeks to go we are making sure all equipment is ready, starting to pray for good weather, transition greens by increasing fertilizer and reducing growth regulator. The plan is to have the fertilizer kicking in as the growth regulator is "petering out". A delicate balance when you consider the golf calendar and uncontrollable weather. I want the holes to close up in two weeks and be smooth (requiring a total of $7,000 worth of sand including thatchy approaches), but I don't want the holes to close so fast I don't get a good seed catch (more desirable creeping bentgrass). We invest a lot in the annual August aerification and overseeding project. Time, money, sacrifice short-term playability of other areas of the course, basically everything we've got to help turf that survived summer stresses, improve summer-thinned turf with overseeding and more importantly start our preparations for this winter's and next summer's stress periods. Yes, we start now! Our goal from now on is to improve our finely managed turfgrass areas to withstand upcoming stresses while balancing the playability our members are accustomed to and deservedly expect. Long story short: It rained, it was cloudy, it was sunny, it was foggy... We finished on Thursday and we even snuck a mowing in on Friday afternoon. They look good! They will only get better! Especially if the annual overseeding takes, turf continues to heal and the members think the course is playing like Augusta by the eighth of September. Give me a call for the long version which comes with more technical references while reducing the ratio of questions to answers depending upon the humor level of the member asking and the relationship within the above mentioned quandaries which can be presented through a possibly anticipated dialogue and the answers I may respond with which is entirely dependent upon the above mentioned but not limited to... as if their really were any questions? Greens will be good in two weeks! Have Fun! In mid-July, soil temperatures at a 3-inch depth were regularly found to be 90°F to 95°F (left) while turfgrass canopy temperatures ranged from 90°F to 105°F (right). Significant root dieback occurred and cool-season turfgrasses simply cannot withstand temperatures this high for an extended period of time. Every year has its challenges, and the weather presents many of them. Much of the stress turfgrass faced this year occurred early in the season. Heavy rains were experienced in June and early July, and oppressive and near record-setting heat made the rest of July even tougher. No golf course escaped those extremes unscathed. The damage was obvious at many golf facilities as turf was lost. However, even those that didn’t lose turf were affected. Turfgrass root systems shrank dramatically, and it was difficult to find annual bluegrass root systems that were more than an inch deep. 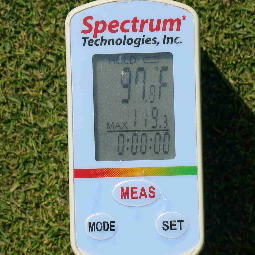 Fortunately, the weather has been mild since July and turf health has rebounded. Root systems still are extremely short, but thinned areas have begun to fill in, and turf that was teetering on the brink of collapse is recovering. To say that we “dodged a bullet” is an understatement. A more typical stretch of stressful weather in August would likely have triggered massive turf loss throughout the region because turf at many golf facilities was very close to the edge. With the stress of July in our rearview mirror, many have already aerated, and many more will do so in the next week or two. Assuming the weather is not too stressful, and thus far August has been a perfect month for aerating, turf that is aerated now should recover quickly because of warm, but not excessively hot, temperatures and longer days. Recovery is much slower later in the fall. To be sure, August aeration can be risky. Stressful weather combined with weak turf and aggressive cultivation practices can cause damage. However, if the turf is healthy enough to withstand it and the weather cooperates, August aeration can produce better turf conditions and an undisturbed schedule for fall golf. It also can provide a great opportunity to get new and improved bentgrasses established in old greens. Continue to manage water carefully and use your best employees for this crucial job. Remember, if the root systems are an inch deep, soil moisture at the 2-inch depth is inaccessible to the plant. Turf with shortened root systems will need more frequent and lighter applications of water, but the goal should be to keep soil moisture levels lower overall by not overwatering. Watch out for high sky, low humidity days. With weak turf and weaker root systems, this is a weather pattern that can wreak havoc. Normal syringing techniques may not be sufficient if we experience this type of weather, so be prepared with more frequent hand-watering should this occur. Plugging bentgrass into weakened areas makes the most sense right now, and 3-inch diameter turf pluggers work very well for this purpose. Smaller plugs are less obvious and less objectionable than traditional 4.25-inch diameter plugs. Plus, smaller turf plugs can be placed much faster and are easier to level than large plugs. There are distinct patterns of stress and turf damage at many golf facilities and, as usual, it is the pocketed greens at most courses that are the weakest. This clearly illustrates the impact poor growing environments, namely inadequate airflow and sunlight exposure, can have on turf performance. Not surprisingly, this is another season where the value of fans to generate air movement is being demonstrated in numerous locations. Fans cool the turf canopy and allow it to dry which goes a long way toward reducing fungal disease activity. Using an infrared thermometer during Turf Advisory Service visits, turf canopies are regularly 6°F to 8°F cooler (or more) than adjacent turf without the airflow of a fan. As you plan for next year, and if you have greens that performed poorly this year from inadequate airflow, strongly consider adding more fans to your equipment inventory. USGA Green Section Update August 7th! 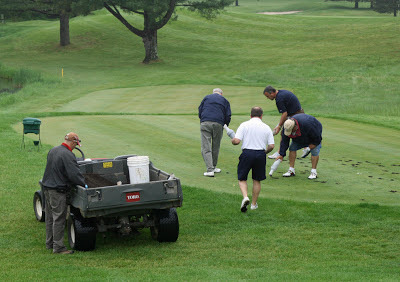 “Skinned knees and bruised elbows, but no broken bones” was the clever response provided by Michael Luccini, golf course superintendent at Franklin Country Club in Franklin, Mass., when asked about the condition of the golf course following the brutal stretch of weather experienced in the Northeast region in June and July. 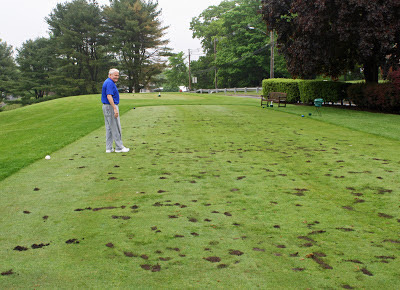 Most golf facilities in the region experienced some bumps and bruises and others broken bones during the stretch of hot and humid weather that followed heavy rains – a perfect recipe for cool-season turf failure. Many parts of the region experienced soil and canopy temperatures well above 90°F during the day without much relief at night. Damage from high temperatures has been common to turf in the Northeast, including scald, wet wilt, Pythium and brown patch disease, foliar anthracnose, dollar spot and summer patch diseases. The inability to topdress during the hot months of June and July resulted in puffy turf conditions on putting greens. As bentgrass turf became more succulent and putting surfaces softer, the turf became more susceptible to mower scalping and traffic damage. Greens located in stagnant environments suffered the most as did poorly drained areas and anywhere flooding occurred. Golf facilities with heavy cart traffic and busy outing schedules in June and July also experienced considerable turf damage. Fairways and roughs with excessive thatch or rough areas composed of creeping bentgrass and annual bluegrass (Poa annua) did not hold up well through this subtropical weather pattern. What are some things we should learn from the summer of 2013? • Deferred maintenance is not a formula for long-term success. Just think how much better things might be right now had the drainage project been completed, the trees removed, the fairway and rough aerification programs maintained, poor quality roughs regrassed, and the problematic greens rebuilt? Sometimes it takes the perfect storm of events like those of the summer of 2013 before this message hits home. • More is not always better. This was especially true with nitrogen applications. High rates of controlled-released granular fertilizers did what they were intended to do in wet soils at a high temperature: they released nitrogen. This was sometimes to the detriment of the turf. • Fans really work well where they are needed. Obtaining fans in July was like trying to find an air conditioner. Good luck. Seriously though, the new generations of fans are powerful, quiet, effective and a must for areas where natural air circulation is limited. • Mowing over wet, saturated soils in mid-summer is never good. Sometimes it has to be done, but if a mowing can be skipped it may just allow you to live and fight another day. That can be said for cart traffic as well. • Large tournaments or outings are best scheduled outside of July if at all possible. 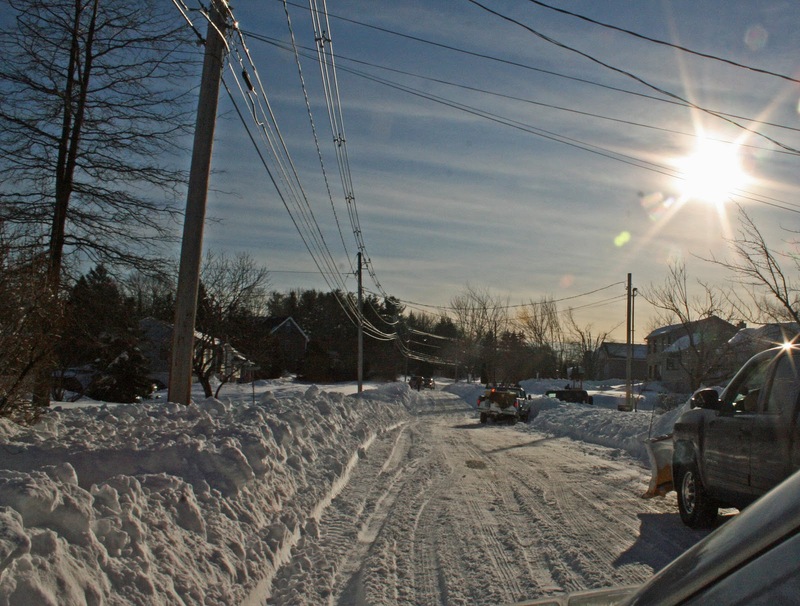 Prepping for a big event during extremely stressful weather is asking for problems. It is also much harder for the staff to syringe and take other protective measures during such events or when the golf course is at full play. • Crabgrass really does well in the heat and preemergence herbicides just do not hold up as long with hot, wet soil conditions. • Mother Nature remains the boss. We have more tools than ever to manage golf courses and we do it better than ever, most of the time. When the weather becomes truly difficult, the best we might do is to just ride it out. Defense wins championships as the saying goes, and good offense takes the pressure off the defense. It is a balancing act to be sure. Fortunately, as quickly as the tropical-like rains and heat arrived, they have been displaced with cooler and drier air. The break in the weather has even produced some good overseeding results that did not seem likely several weeks ago. 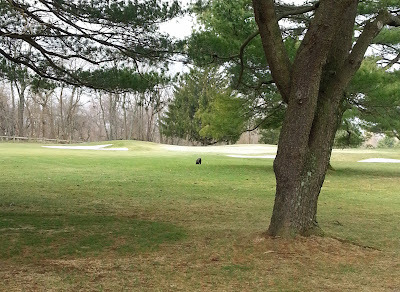 We are certainly not out of the woods yet, especially given the weakened condition of the turf and the possibility that weather patterns could change back to summer heat just as quickly. Nonetheless, we will take this break and hope it continues into mid-August when we all anticipate better growing conditions, shorter days and cooler nights. So, if you are one of the fortunate ones to only experience some skinned knees and bruises this summer, I would say you are doing a lot of things right. If not, it is time to reevaluate the practices in place and reconsider the investments that will allow the turf to better survive extreme weather conditions without completely sacrificing playing conditions. Golf courses maintenance staffs throughout the region have been on high alert over the past two weeks because of extreme heat and oppressive humidity. The dew point remained above 73°F, heat indices exceeded 110°F, and soil temperatures were over 95°F for several days last week. To put things into perspective, cool-season turfgrass grass roots begin to decline when soil temperatures exceed 80°F, let alone 95°F. The recent environmental stress has resulted in grass decline at many golf facilities in the region, particularly on putting greens with limited air movement, shade, and/or poor soils. Heavily trafficked fairways have also experienced problems. Decline has been most severe on golf courses with high amounts of stress-intolerant annual bluegrass (i.e., Poa annua) and those with irrigation limitations (e.g., old systems and/or insufficient labor to hand-water and syringe). Damage observed has been as minimal as slight discoloration (i.e., yellowing) and minor thinning to severe grass loss requiring temporary putting greens. Many facilities have held up well to the extreme heat by employing defensive management programs geared to keep grass alive. Defensive management programs are all about promoting healthy grass and alleviating stress; with less emphasis on maximizing playing conditions. 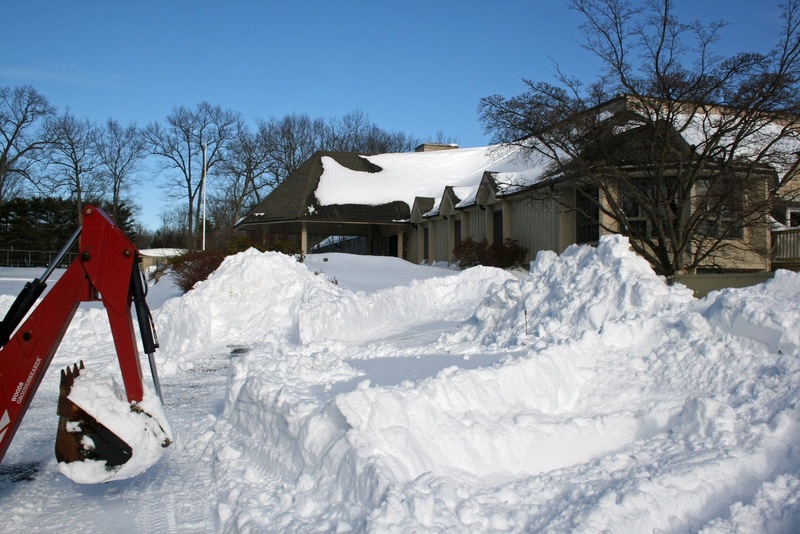 When the weather is severe, even the most highly regarded golf facilities must back off and temporarily lower expectations for golf conditions to preserve grass health. The article Playing Defense is a Strength, Not a Weakness provides useful information on defensive management practices. 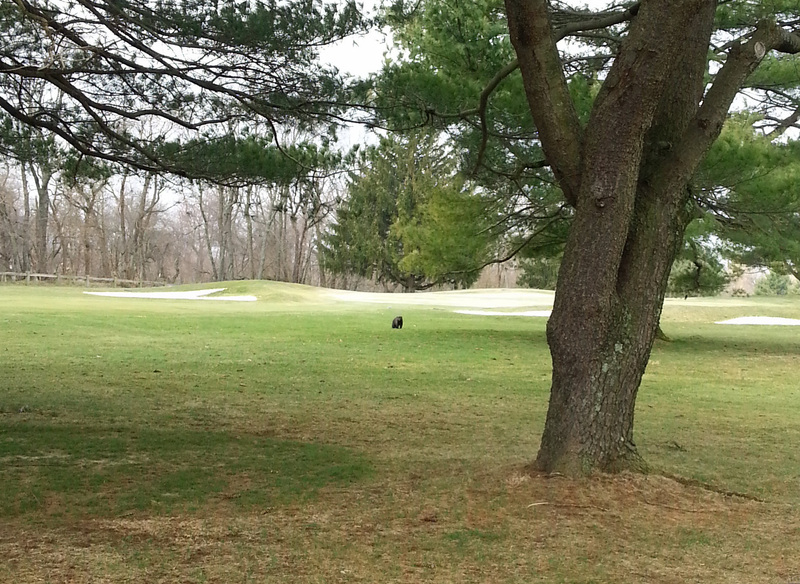 A key reason why many facilities have held up well to the heat is because they’ve previously addressed concerns with limited air movement, shade and tree root competition. Tree removals to improve sunlight and the use of oscillating fans to generate air movement are very helpful to improve grass performance so it can survive environmental stress. 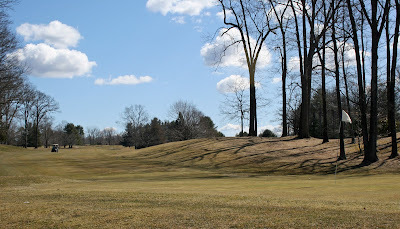 The Green Section Record articles Man’s Friend or Golf’s Enemy and Using Turf Fans in the Northeast are good references for examining putting green microclimates. The environmental stress and subsequent decline of annual bluegrass putting greens has inspired many facilities to begin discussing the potential for regrassing to creeping bentgrass. Regrassing is not a simple project and improvements to the golf course infrastructure (i.e., increasing sunlight, improving drainage and addressing traffic concerns) are needed for creeping bentgrass to be successful, but the results will be well worth the effort. The Green Section Record articles Putting Green Regrassing and So Much More and Regrassing Greens at New Haven Country Club are great resources for facilities considering putting green regrassing. The 2013 US Open Championship! To me it is one of the greatest tests in golf for both players and the preparation of the course. How does the superintendent handle it? Take a look at the following links for a slide show and pictures with captions. Both were provided by the USGA Green Section. Thank You! You will see many maintenance practices we employ at our club but it will also provide a perspective which shows the impossibility of our chance at replication. 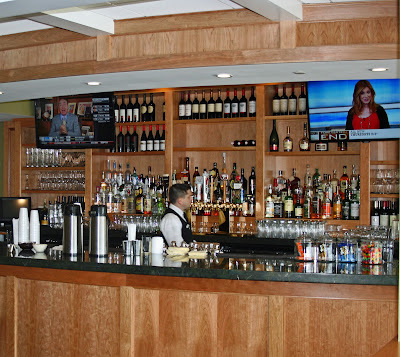 They have 175 people preparing Merion! I must make mention that one of my friends, Jon Jennings, is in the slide show. 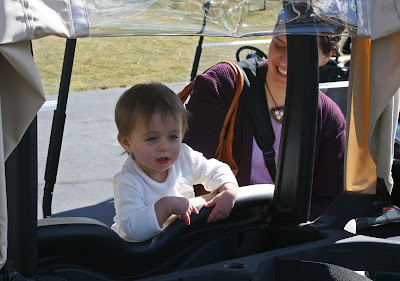 He is now the Superintendent at Shinnecock Hills Golf Club. He is a volunteer at Merion to prepare for his hosting of the 2018 US Open. He's the guy with the red hair changing cups. His roots start at Madison Country Club under the tutelage of Superintendent Mike Chrzanowski. Hey Mike and Jon... I Hope you don't mind me singling you guys out! Thank you to our dedicated participants! Every divot on every tee and fairway has been filled! The process took all of one hour and forty-five minutes. Our participants were treated to a wonderful breakfast prepared by General Manager, Sean McLaughlin, before they hit the course at 7:30AM. Thanks Sean! Six teams took care of three holes each. Everyone is always amazed at how many divots go unfilled on the course until they see them filled. I want to give special thanks to Jim McMahon Sr. who organizes the teams and supervises this awesome event! 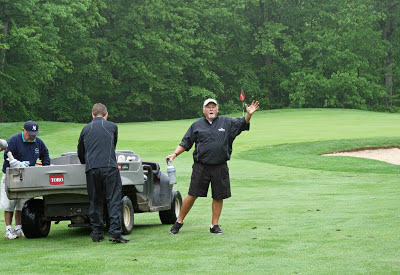 Green and Grounds Chairman, Barry Burke, not only helps organize and recruits members but gives our maintenance staff the support in pulling off the event. Thank you Jim and Barry! 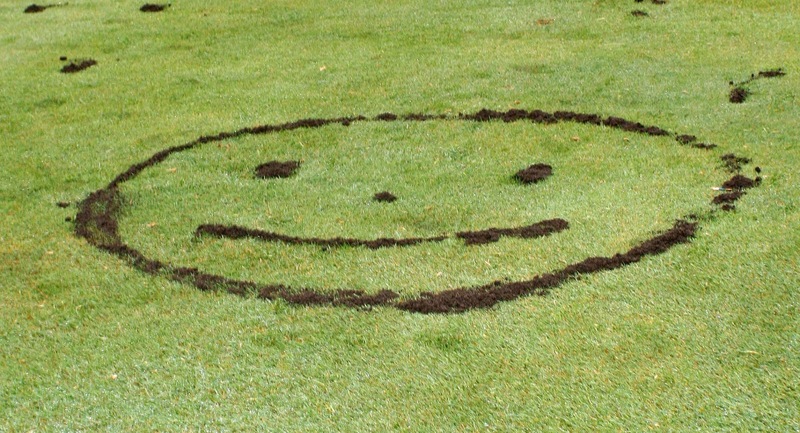 We hope to hold another Divot Day later in the season. If you have not had the chance to attend in the past, please try in the future. There is some work involved but it is definitely fun! Harry Black leaves us his customary smiley face. That says it all! 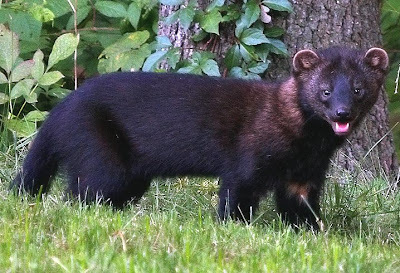 Course Update and Rarely Seen Fisher! Aerification of our greens is complete! We have some fine tuning to do as far as topdressing, but all greens are open. I am hoping that we get the forecasted rain and some warmer temperatures in the following days to facilitate healing and Creeping Bentgrass seed germination. We appreciate your patience while we finish preparing the greens for an awesome season. Remember, aerification is the most beneficial cultural maintenance practice we perform every season. While the next couple of weeks may be a bit of a sacrifice in playability, it also secures our ability to maintain optimum playing conditions during the "Prime" season. We are continuing the bunker repairs and will be sodding some surrounds soon. Things are really shaping up! 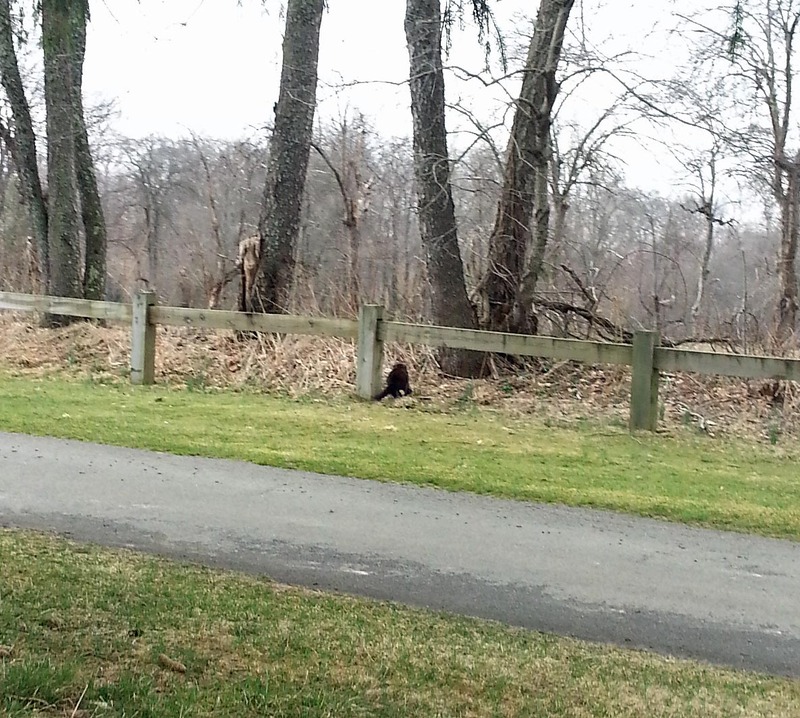 I had the pleasure and luck to see something I've never seen before on the course in my thirty years at the Farms CC, a Fisher (also commonly known as a Fisher Cat). Please understand that I took the following pictures with my phone and I was far away! Here is a photo I found on the Internet. Pretty Cool!!! 2013 Golf Season Off to Great Start! We opened the course on Friday, March 29th and haven’t looked back. Members were treated to fast firm conditions. The maintenance staff is focusing on preparing the course for another outstanding season. We started with course cleanup and bunker preparation. 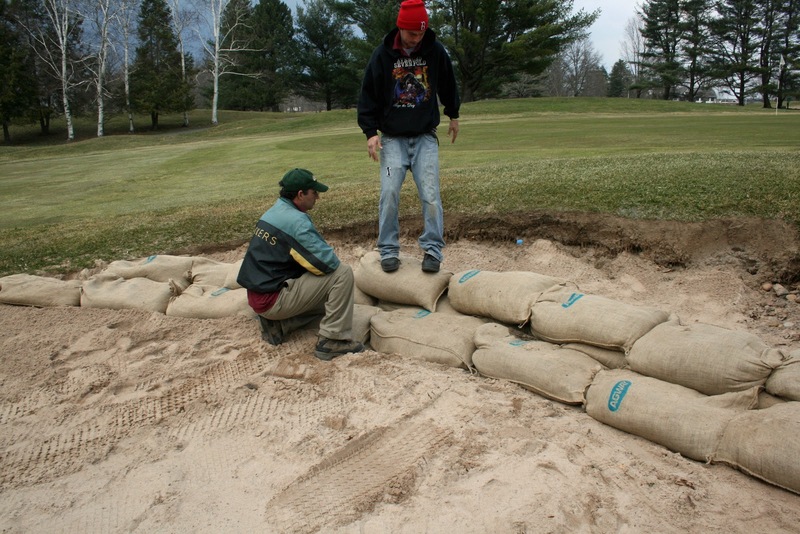 Bunker preparation is one of our main goals this spring. We are edging all bunkers and manipulating proper sand depth right from the start. Unfortunately, our progress has been slowed by frozen ground this past week. Long range weather forecasts look positive and we should be able to move quicker. You will notice that we are initially skipping some bunkers. We plan to sod some of the areas around these bunkers. We need to coordinate all sodding with delivery of the product. Once sod preparation is complete we will finish the selected bunker surrounds. We have begun a small project to improve #1 greenside bunker. This is not a complete fix, but should improve playability and reduce maintenance costs. Burlap bags filled with soil define new edge. ﻿﻿Green aerification will begin Monday, April 8th. The course will be closed Monday and Tuesday. 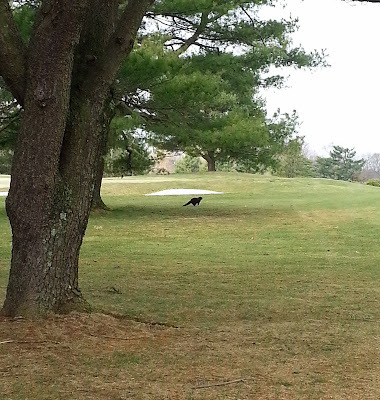 Wednesday’s course availability will be determined by our success and Mother Nature’s cooperation. I will keep you informed! The irrigation system has been “fired-up” and is ready for aerification. We take no chances with our greens! We have completed our crabgrass preventative in the majority of the rough. 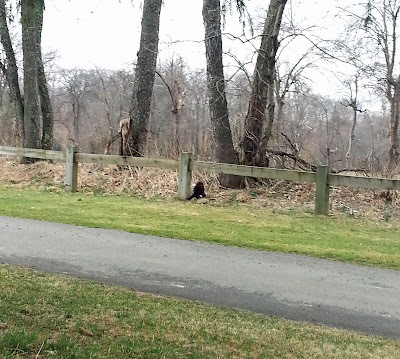 Bear with us while we perform the all-important spring maintenance tasks which set the tone for the outstanding season ahead! The Farms Opens With a Bang! Excitement abounds with the opening of our club! 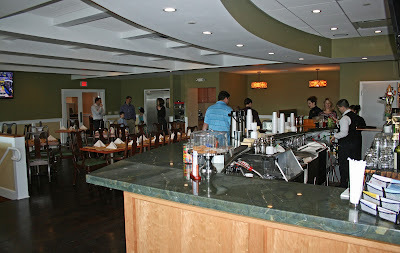 Between the greens rolling over ten feet and the new grill room (and more) and Easter weekend it couldn't be better! 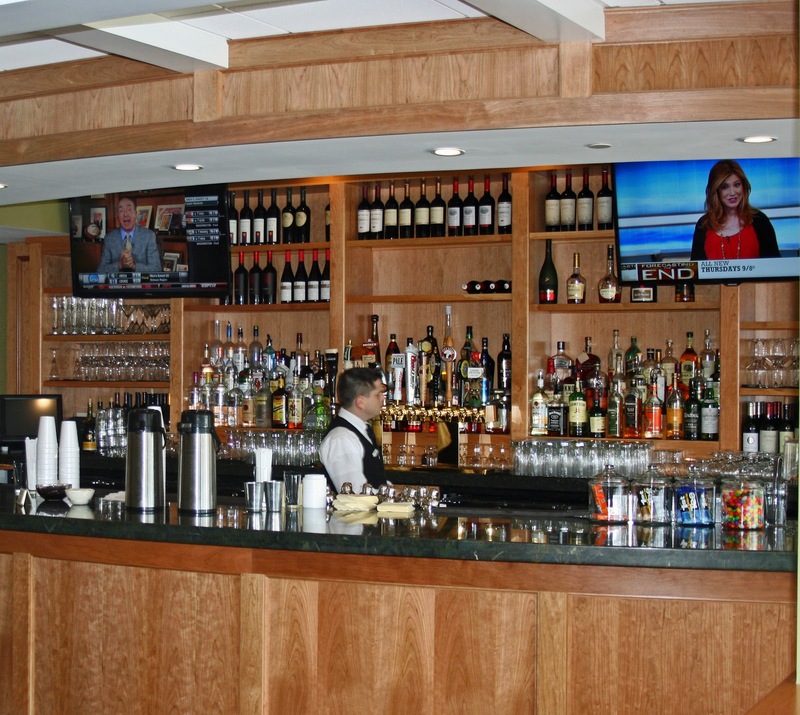 Don't miss this spectacular opportunity to enjoy every facet of the club right now! Dawn Teaching This Young Lady How To Shop! Looking For a Game? Probably an Easter Egg! New Grill Room a Hit! The Farms Gets Hammered! 38 inches??? 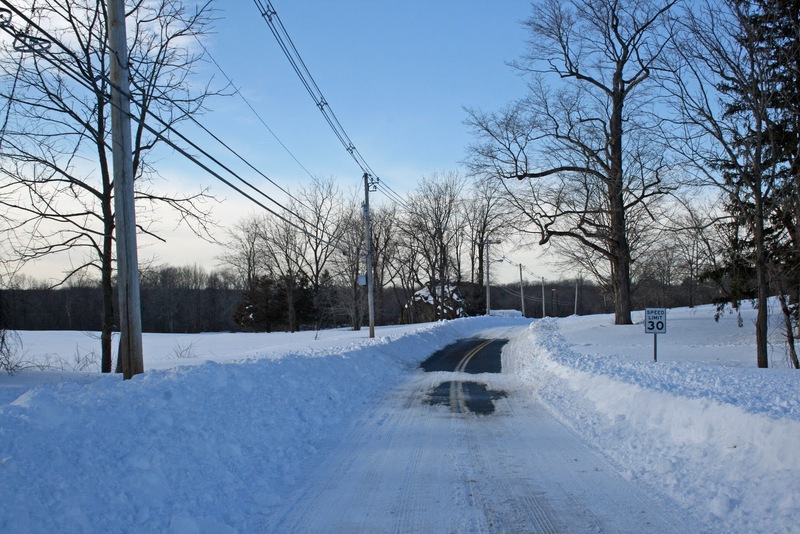 Wallingford is not one of the official measurement stations for the state of CT. We know we had at least 35 inches of snow! The only way to clean our lot is by loader. 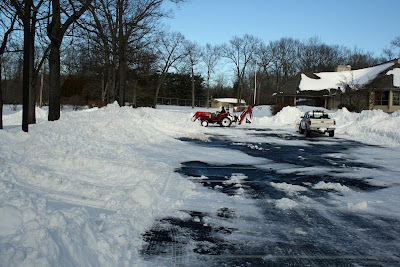 It took 5 hours to just clean our maintenance driveway so we could get to the clubhouse. The pictures will speak volumes!!! 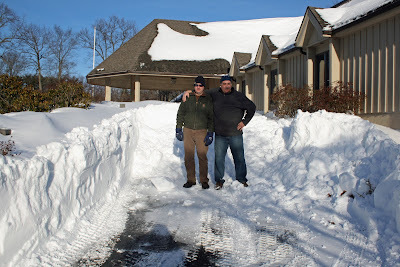 I'm very proud of the hard work the maintenance staff performed under the most grueling of circumstances! We still have a long way to go. 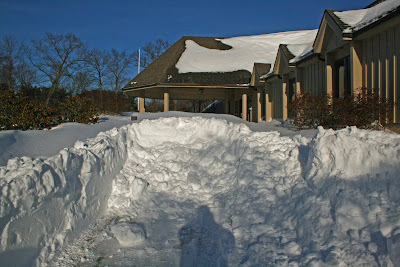 Our #1 priority is to make the clubhouse accessible for staff tomorrow by 10AM! 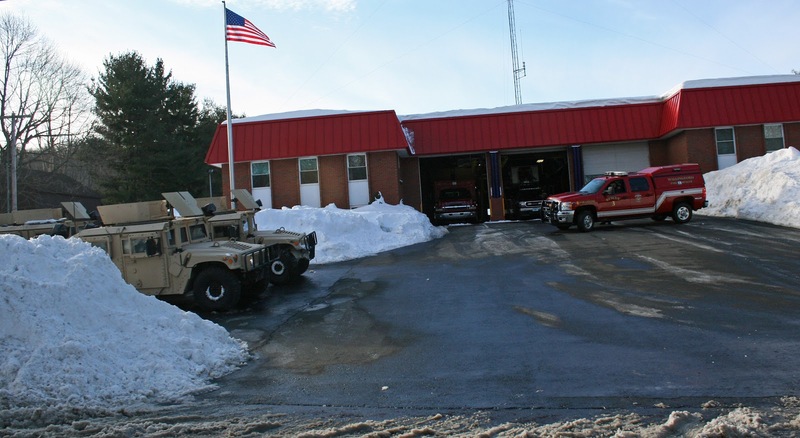 Maintenance facility cleaned first... Obvious reasons! Both loaders working. Plow truck can't handle 38"'s!!! It So Bad That National Guard Called In!!! Have to give this to nice lady... I had to let plow truck go by and I pulled in. We have ties in our neighborhood that go back to 70's!!! She awesome! Andy and Paul Add Scale to Pic! I have a great Idea! 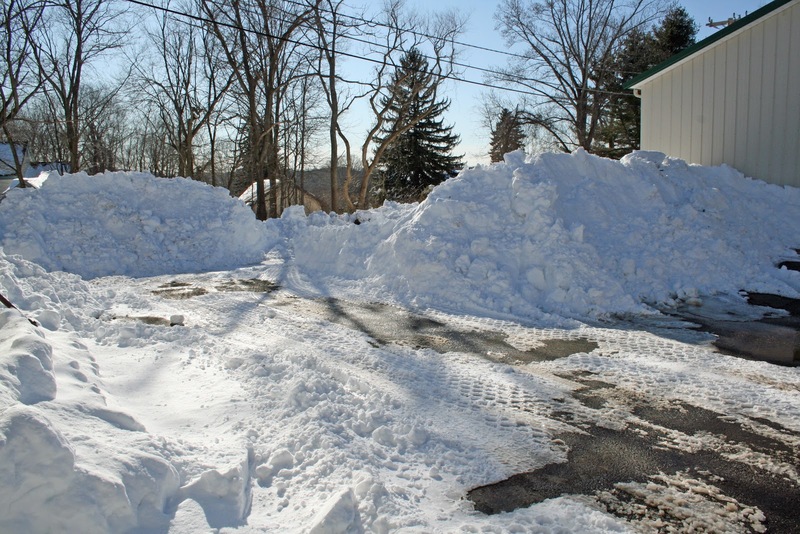 Everyone should send me their pictures of this monumental snowstorm so I can post for all to see! Send me everything you have of "you and yours!" You know the address! I'll post it in a slide show! I was thirteen when we had storm in 1978. It wasn't as bad as this. Once in a lifetime! Maintenance Staff Prepares For Blizzard! We are getting ready for what is supposed to be an intense winter storm. There is a blizzard watch in effect for our area beginning tomorrow, Friday, at noon and continuing through Saturday morning. 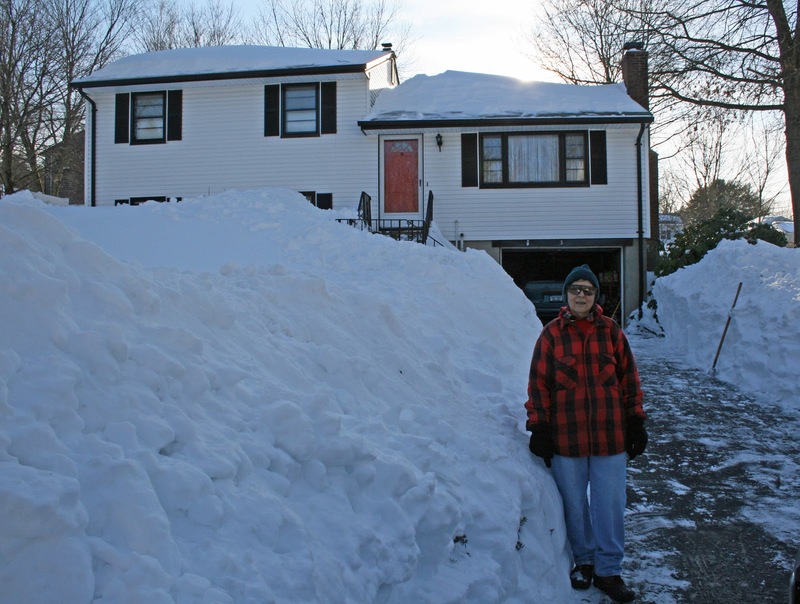 Computer models are projecting anywhere from ten to twenty inches of snow or more. Wind gusts may exceed fifty miles per hour. 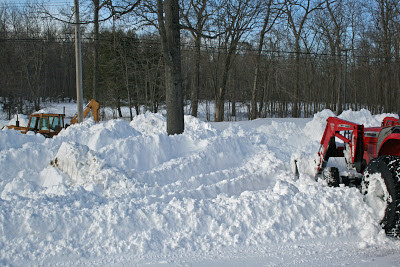 The maintenance staff is preparing all snow removal equipment in anticipation of this impressive weather event. I will follow up with subsequent blog entries as time allows. Good luck to all and be safe! Chris Berry helps get the sander ready!